On November 18, 2007, H.E. Mme. 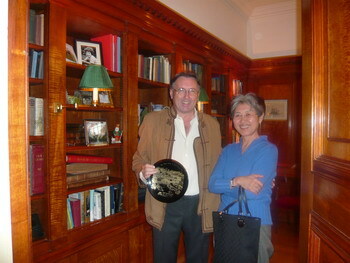 Ambassador Fu Ying attended the luncheon held by Timothy Beardson, Chairman of China Oxford Scholarship Fund. Mr. Beardson introduced that the Fund was established in 1992 and has always committed to provide scholarship to excellent Chinese students to support their postgraduate study in <?xml:namespace prefix = st1 ns = "urn:schemas-microsoft-com:office:smarttags" />Oxford University. The Fund plans to further expand its scale and increase the number of scholarship from 8 to 20 or 25. Mr. Beardson also denoted that some sponsors have special requirements on subjects, for example, a lady hopes to sponsor study of poems, believing that fast developing China needs more talents in humanities, but no proper candidate has signed up for a long time. Fu Ying appreciated the efforts made by the Fund to promote educational cooperation between China and UK. She promised that the Chinese Embassy in the UK would forward information to relevant universities in China.